Carlos Fernandes is an entrepreneur, innovator and public policy advisor. In 2007, Fernandes founded RecordTV, a company named as one of the Top 100 startups in the world by Red Herring magazine and widely regarded as one of the few companies on the forefront of the disruption of the TV industry. At RecordTV, he led the company through turbulent litigation against one of the largest media companies in the region, successfully advocated for an innovation-friendly interpretation of copyright law, and took the company from a few hundred thousand in funding to millions of dollars in profits. Following this success, Fernandes was selected as a Young Global Leader by the World Economic Forum and invited to serve on its “Future of Media” Global Agenda Council. In the area of public policy, has served the Commonwealth Nations, ASEAN and Singapore as an advisor on matters related to youth development, technology and entrepreneurship. For the Singapore Government, most recently he served on the Entrepreneurship Review Committee and continues to sit on the Pro-Enterprise Panel. Fernandes has been a Board Member for TiE Singapore, an adjunct professor at NUS and guest lecturer at INSEAD and SMU where he has lectured on Disruptive Innovation and Entrepreneurship. 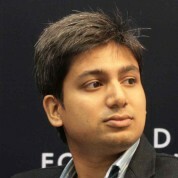 He has an MBA (High Honors) from the University of Chicago, a Bachelors in Electronic Engineering from Bombay University.